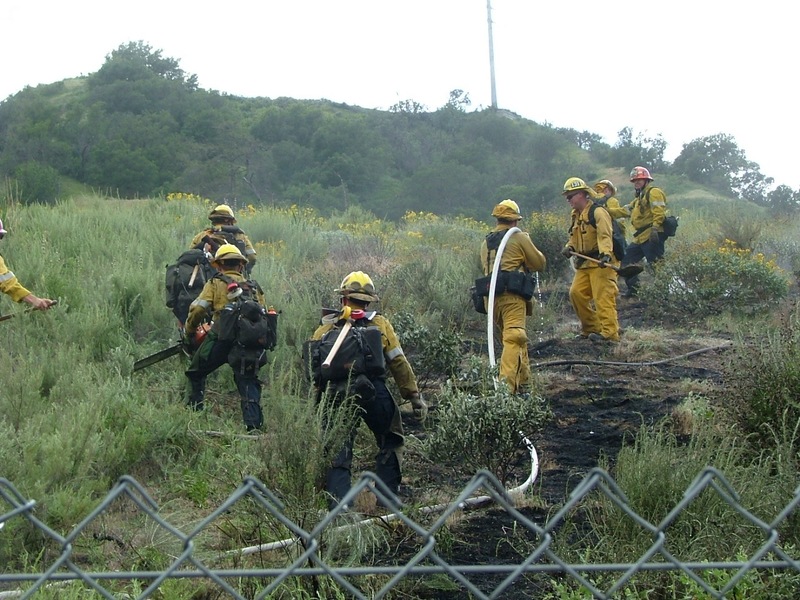 Los Angeles County firefighters made quick work of a small brush fire in the Newhall Pass on Sunday afternoon. The fire broke out along The Old Road under an Interstate 5 overpass. “We got called out at 2:42 p.m. for a brush fire on the southbound lanes of The Old Road at the transition of (Interstate) 5 and (Highway) 14,” Inspector Gustavo Medina said Monday morning. Units from engine companies 124, 73, 126, 76, 111 and 156 were dispatched to the scene, as were three water-dropping helicopters, Medina said. Upon arrival, the Battalion Chief noted the fire had burned less than a quarter-acre, with medium fuels, Medina said. There were no injuries. The cause of the fire is unknown and under investigation, Medina said. Kevin Gilley of two8nine media caught the scene in the accompanying photos. Brush fire on The Old Road, Sunday, April 29, 2018. | Photo: Kevin Gilley/two8nine media.